As hyperbolic as it my sound, a Swedish brewery may have just made the single most important advancement in the history of mankind. No, it didn’t cure cancer or invent some kind of life-changing device that can play both Xbox and PlayStation games, but it did make a pretty exciting potato chip. Well, it’s exciting as far as potato chips go, which isn’t extremely exciting in the grand scheme of things, but it’s still neat. 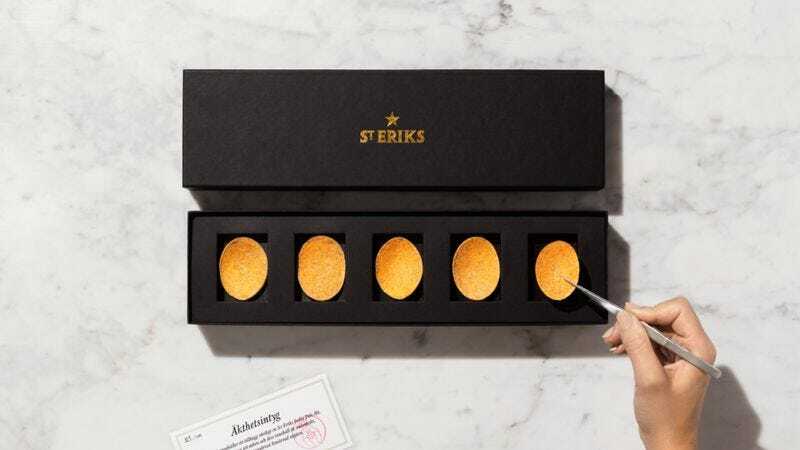 They’re dubbed “the world’s most exclusive potato chips,” and if they’re half as fancy as their official website makes them out to be, then there are very few humans alive who deserve to eat them. The chips come from a brewery called S:t Eriks, and they were designed to be the perfect compliment to the brewery’s special IPA. They’re all sold out now, but only 100 boxes were made and each one was sold for about $56. Also, each box only had five chips. So what makes these things so expensive? For starters, they were co-designed by the Swedish National Culinary Team, which sounds super cool. Also, they’re made from special potatoes that can only be found on the side a steep hill in Sweden that is too rocky for machinery to operate on, meaning all of the potatoes are planted and harvested by hand. Still not fancy enough? The chips were also made with Leksand onions, which is a special kind of onion you can only get in a small town in Sweden. These onions are apparently the best because they “are always planted on May 18 and harvested on August 10, whatever the weather.” There’s also fancy seaweed that tastes like truffles, special dill flavor that was specifically uncovered by chip scientists, a mushroom that is apparently the “most sought-after” in the world, and freeze-dried wort left over from the process of brewing the aforementioned IPA. We’re not sure what a lot of that means, but it seems pretty damn fancy. Luckily, since very few people will ever get to eat these magnificent bastards, we don’t have to feel bad for sticking with our trusty Wal-Mart-brand potato-flavored crisps.